See more Thomas Sabo Bracelets. We check over 450 stores daily and we last saw this product for $205 at Selfridges. Diamond Lux 18k Green Gold Diamond Pavé Bracelet, .14 Ct. T.w. Let your choice of gift speak a thousand words with Thomas Sabo's Love Bridge bracelet. Crafted from 18-carat plated rose gold, the white zirconia embellishments and filigree bridge are flanked by a radiant heart and infinity symbol, creating a romantic piece to seamlessly slot into everyday looks. Personalise your Thomas Sabo bracelet in store with the complimentary engraving service at the Thomas Sabo counter in Selfridges Oxford Street and Manchester Trafford. Please bring your bracelet and online receipt to be able to use this service. 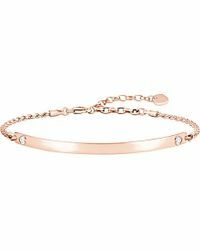 Thomas Sabo 18ct rose-gold plated and zirconia bracelet. Lobster clasp fastening. 925 sterling silver, 18ct rose-gold plating, white zirconia. Width 0.4cm.